Adapting to change requires extra energy. With the carefree days of summer coming to an end and the fall season looming before us, children getting ready to return to school, people start to buckle down to prepare for winter - all this requires changes to our routine. Too much change can lead to negative stress and poor health. Think of yourself as a rechargeable battery with so much energy to spend at any given time. When the energy is used up, we have to recharge it by taking rest which restores our batteries. Regular routines require less energy and our batteries last longer. But when we have changes in our habits, we use extra energy called "adaptive" energy. Think about the time you moved into a new house. Things you used to take for granted, for example, the location of your vacuum cleaner or where to hang certain jackets or even where the light switches are, now require thought. We've all been there. What is easy in the old house requires thinking in the new. When we have too much adapting to do at any one time, we can feel tired and get cranky. Perhaps you have just moved, changed jobs, and you have to get the children ready to return to school. We can feel uptight, stretched like a rubber band and lose our patience with others. What can we do when we're too stretched? Here are three simple strategies for managing our way through a change in season requiring a change in routine. Strategy #1: make a list of action items. 1. Brainstorm - a simple and easy strategy is to take out a piece of paper and write down everything you have to do in the upcoming week. I find doing this on a Sunday while looking at the week ahead works best for me. 3. Review - tape this list to the bulletin board, refrigerator, or place it in your day timer. Don't worry about when you're doing these things. The list will make you conscious of the actions required. At the end of the week, review how you did. You'll be amazed! Strategy #2: Build in rest and repair. When we have too many demands on our time, we are in overdrive and the body is in the sympathetic state of alert. When we stay too long in the sympathetic alert state using too much energy, we burn out. Burning out leads to diminished health and wellbeing and we start a downward spiral leading to more stress. The best way to prevent burnout is to do the opposite. Build in some gaps between activities and move in the direction of under-drive. How can you do this? Give yourself a break; go to the spa and have health and beauty treatments. Slow down. Close your eyes and relax. Have a reflexology treatment, for example. Reflexology is a natural healing art based on the principle that there are reflexes in the hands, feet, and ears that correspond to every part, gland and organ in the body. When having a reflexology treatment, the body naturally goes into the parasympathetic state of rest and repair where tension is relaxed, circulation is increased, and the body can normalize naturally. Be sure to get your nails done after the treatment - a great way to be forced into sitting and letting the circulation benefits get registered in the nervous system. Too many demands and pressures, too often and too long, use us up until like the stretched out rubber band, we snap. Too little activity and too little stress with too few demands on us results in a dull system and like the unused rubber band that sits in our desk drawer for years, once taken out to use, it crumbles. We want Eustress which is a Greek word meaning good stress. We all need some tension in our lives but we want healthy tension - just enough demands and pressures on our system followed by rest and repair is the way to stay healthy. Remember that stress is accumulative which means that the more stress we have, the more stress we tend to get. The same is true with rest and repair. We repair, recharge, and regenerate more quickly when our nervous systems are rested. Most of us take our gifts and strengths for granted. Because of this, we often forget to acknowledge who we are and what we do to contribute to others. As we would acknowledge others, we should also see and acknowledge ourselves because we are important too. Take a moment and just acknowledge yourself and pat yourself on the back. You're OK, you know. In fact, you're great! 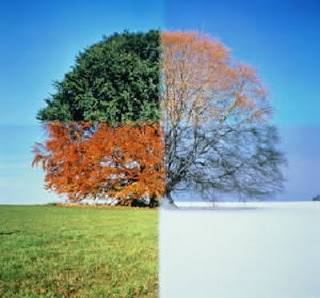 As we move from one season to another, demands and changes in our routines place constraints on our time and energy. Be sure to take care of yourself along the way. If you don't take care of yourself, there is only one end in sight. Poor health. Stay well. Be conscious of the demands on your time and energy. Build in rest and repair. And acknowledge yourself! RCRT, BA Psych. HRM Post-Grad.